November 30, 2011  The major central banks of the world moved Wednesday to prevent a banking crisis in Europe. They're providing more liquidity to the European banking system in hopes that big banks there will remain solvent and continue to make loans. 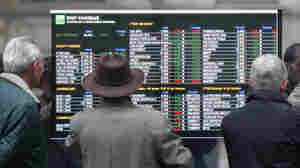 The coordinated move by the central banks sent stock markets soaring. But it will not even begin to fix Europe's fundamental economic problems. November 30, 2011  The Federal Reserve joined other major central banks Wednesday in a coordinated effort to shore up the global financial system. The move comes at a time when credit is becoming tighter, especially in Europe, because of doubts about the health of big banks. November 29, 2011  A federal judge has nixed a $285 million settlement between Citigroup and the Securities and Exchange Commission. He said the deal was "neither fair, nor adequate nor in the public interest." The settlement dealt with Citigroup's handling of subprime mortgage debt prior to the financial crisis. November 24, 2011  Tax evasion is a long tradition in Italy. But with the country facing a crippling debt crisis, the new prime minister hopes to convince markets that he can get tough on those who refuse to pay up, and perhaps change Italian attitudes about tax avoidance as well. November 23, 2011  Pharmaceutical company Merck has agreed to pay nearly $1 billion to settle charges that it illegally marketed its painkiller Vioxx. The drug was taken off the market in 2004 after questions were raised about its safety. November 21, 2011  The financial markets will be keeping an eye on Italy this week. The country is plagued by high debt and rising interest rates, and the new government faces steep fiscal challenges. Italy is a country of small and medium-sized businesses, and the debt crisis is making it much tougher for them to hang on. November 16, 2011  As investors lose confidence in the eurozone, interest rates are rising everywhere but Germany. Economists say that even France could be dragged into a situation like Italy, where more expensive borrowing necessitates deep budget cuts. Leaders are at odds over whether countries should spend or cut their way to health. November 9, 2011  As fears about the debt crisis in Europe intensified, investors showed how little they like economic uncertainty. Stock prices took a nose dive around the world. The Dow fell 3.2 percent and other indexes were down even more. 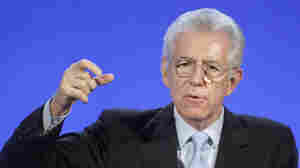 The stock sell-off followed a steep rise in Italian interest rates. November 8, 2011  On the face of it, Italy's economy has plenty of strengths. But its total debt is equal to 120 percent of its GDP. And with the cost of borrowing quickly rising, investors are growing increasingly concerned with the risk of default, which would spread throughout Europe and the rest of the world. October 31, 2011  Europe's debt crisis claimed another victim Monday morning, and this time the casualty was an American firm. MF Global Holdings filed for bankruptcy after an unsuccessful effort to find a buyer for the ailing firm. MF Global is headed by Jon Corzine, the former governor of New Jersey, who reportedly bet on the direction of European bonds — and lost. October 30, 2011  European leaders have a big task ahead of them. They have to begin fleshing out that big debt plan unveiled to so much fanfare in Brussels this week. The plan represents the most comprehensive effort so far to resolve Europe's grinding debt problems, but some issues may require a global effort to solve. October 28, 2011  U.S. stocks had one of their best days in weeks Thursday: The Dow jumped nearly 3 percent and prices in Europe went through the roof. The surge came after the announcement that European leaders finally agreed on a comprehensive plan to tackle their debt problems. Does the rally mean investors think the crisis is over? October 27, 2011  The deal that is supposed to solve the European debt crisis has been unveiled, and financial markets like what they see — even though there isn't a lot of detail on some parts. Banks will take a big hit on Greek debt, the eurozone's bailout fund will be robust and a plan to recapitalize European banks emerged. 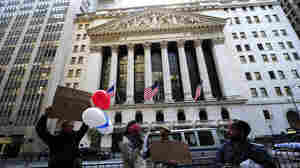 Occupy Wall Street participants demonstrate in front of the New York Stock Exchange in September. The group's press team says the point of the protests is to address the public and not CEOs, whose headquarters have left Wall Street. October 24, 2011  Technology has allowed many of the bigger firms to leave Wall Street since trading is done electronically, "on a computer somewhere in suburban New Jersey," as one expert notes. But demonstrators with the Occupy Wall Street movement in nearby Zuccotti Park say the Street is still an important symbol.